A huge and largely overgrown Jewish cemetery in Warsaw that is not only exceptionally large but also very atmospheric to behold. More background info: The Jewish cemetery (in Polish: Cmentarz Żydowski) on Okopowa Street in Warsaw is one of the largest such burial grounds in the world, with more than 200,000 tombs. It was founded at the beginning of the 19th century on the then outskirts of the city to replace several previous smaller cemeteries. It was to serve Jews of all denominations (from Orthodox to Reform Judaism) but each were given separate sections. When Poland was invaded by Germany in WWII, the cemetery was closed but – remarkably – not destroyed by the Nazis (like in so many other places, cf. e.g. Izbica or Suwalki). 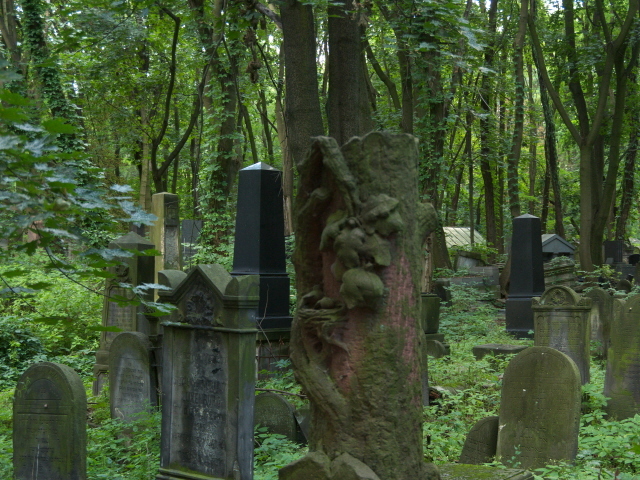 Yet with such a large proportion of Jews having perished in the Holocaust in Poland, most of the cemetery remained abandoned after the war and is now so overgrown that it is practically a forest with weathered graves between the trees. 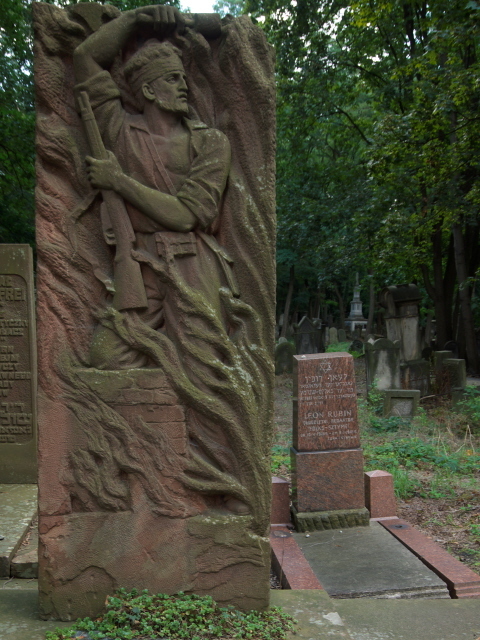 The cemetery was reopened by the remaining Jewish community in Warsaw, small as it was, and a relatively tiny portion is still in use. Many victims of the Warsaw Uprising were buried here too. Amongst the more prominent names to be spotted on headstones here is that of Marek Edelman, who was the last surviving leader of the Warsaw Ghetto Uprising until he too passed away in 2009, aged almost 100 years. He had also been a prominent activist in Poland's struggle against communism and had taken part in the Round Table Talks of 1989 as a member of Solidarnosc (see Roads to Freedom, Gdansk). Another famous name here is that of Ludovic Lazarus Zamenhof – a name that many a street in Poland bears. He's famous primarily as the inventor of the “artificial” language Esperanto. He died in 1917 and was buried here – while his entire remaining family was exterminated in the Holocaust. In recent years more modern memorial monuments and plaques have been added on or near the inside of the wall around the cemetery stretching northwards from the entrance. What there is to see: When you get to the entrance take a note of the Warsaw Ghetto plaque on the outside before heading in. This involves a relief map of the ghetto on which you can see that the cemetery was located right on the ghetto's western edge at that time. As a plaque informs it was excluded from the ghetto only in December 1941. The plaque is attached to a wall that was apparently part of the 1940-1943 ghetto wall. Once inside the cemetery you have to pay your admission fee (see below) and then you are free to just roam. If you are interested in finding specific individual graves, a large panel with a plan of the cemetery and a long list of names can help you locating those. Note also the original gate set back a bit from the current entrance and the admission ticket booth. It was turned into a memorial in 1998. Many of the grander monuments, and also the newer graves are lined up along the main lane heading north from the entrance parallel to the outer wall, so these are easier to get to. Others may require a longer search. Alternatively you can simply take in the atmosphere of this cemetery. Once you head a bit deeper into the overgrown parts it becomes quite enchanted. In addition to the overall atmospheric look also keep your eyes open for little details and unusual tombstone designs. Other cemeteries may have a greater variety of those, but there are a few remarkable specimens here too (see photo gallery). The majority of stones, however, are relatively simple in design. Many are covered in Hebrew inscriptions. Amongst the tombs of note are those with a clear message, such as the depiction of a resistance/uprising fighter in full battle pose. Here and there you can also spot the symbol of the Warsaw Uprising, e.g. in the form of little flags attached to certain headstones. Grave monuments that also stand out are those that are of unusual designs, including some in an art nouveau style – whereas most monuments are rather in the classic Gothic style. Back closer to the entrance, take a look at the large number of memorial plaques set into the inside of the outer wall around the cemetery. Quite a few are in English and have come from abroad, such as from the USA or Australia to honour family members who perished in the Holocaust and WWII. There are also a couple of lager monuments. One consists of the pattern of a menorah set into the ground at the end (top) of which is a smaller memorial wall with a patch on the ground onto which ltlle mementos have been places, mostly little stones/pebbles (as is the Jewish tradition) but also various photos, many showing children. You can recognize a few of these familiar from various history books and exhibitions. Especially recognizable is the image of Anne Frank here. 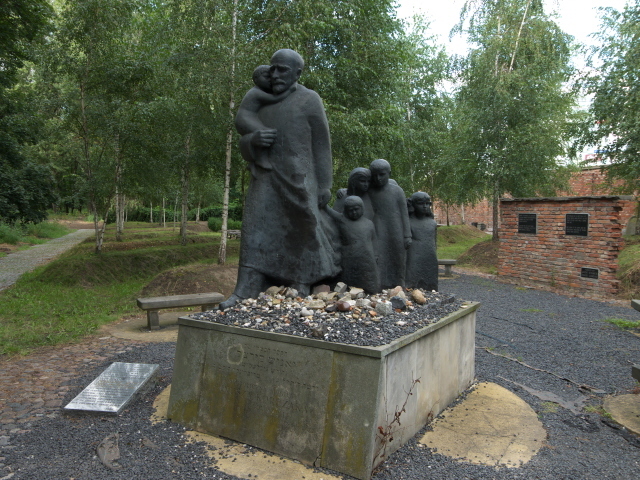 Nearby stands a larger sculpture group depicting Janusz Korczak and a bunch of children – which is a reference to the Korczak orphanage, of course, and the great pedagogy reformer's sacrifice (accompanying his orphans into the gas chambers of Treblinka). Overall: this cemetery's mixture of general beauty of decay and individual items of sepulchral art, plus the newer memorials, make it well worth paying it a visit. It's also a worthwhile add-on to the Ghetto Trail, of course. Location: to the west of the central parts of Warsaw, and the area of the former ghetto. The entrance is on Okopowa Street opposite the corner with Anielewicza. Access and costs: a little off the main beaten tracks, but fairly easy to reach; a small entry fee is charged. Details: it's fairly easy to get to the cemetery thanks to the tram lines that run along Okopowa Street (lines 1, 22, 27 – the cemetery has its own stop: Cmentarz Żydowski). Bus lines 111 and 180 can be useful too, especially as these also connect the cemetery to the POLIN Museum and the Ghetto Uprising Monument (and on to the city centre of Warsaw). The distance to/from the museum is also walkable, as it's only about a mile (1.5 km). Opening times: weekdays from 10 a.m. to 5 p.m., or until dusk in autumn and winter, except Fridays, when it's open from 9 a.m. until 1 p.m., and Sundays when it's open from 9 a.m. to 4 p.m.; closed all day Saturdays and on Jewish holidays. Time required: For just an impression of the general aesthetics of this place, something between half an hour an a full hour may suffice, but if you want to explore deeper and identify various specific graves, then you'll obviously need longer. The most obvious and most relevant combination has to be the Ghetto Trail and the new POLIN Museum of the History of Polish Jews, which has several sections about Jewish Warsaw, as well as about the ghetto and the Holocaust. Just round the corner from the cemetery, on its southern side at Edwarda Gibalskiego 21 is the seat of the Nissenbaum Foundation that is heavily involved in the preservation of Jewish sites in Poland, including the cemetery (it also co-operates with the POLIN Museum). Next to their HQ is a relatively new “Memorial to the Martyrdom of Jews and Poles”. This consists of a grey-marble-clad hollow with a single stele made of black rock as well as of an older granite memorial stone and a couple of plaques. One of these explains that the memorial sits at the site where human remains from mass executions by the Nazis, presumably of Jews from the adjacent ghetto, were discovered in the 1980s. 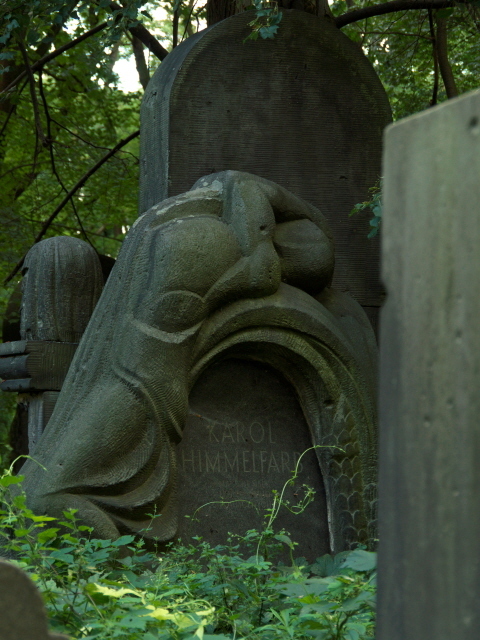 The Jewish cemetery is flanked by a Catholic one to the north and a Protestant one to the south. Yet another Jewish cemetery (Brodno) can also be found in the district of Praga on the other side of the river. In terms of the number of people who have been buried here this is even larger than the one on Okopowa Street. But while the latter survived the war relatively unscathed, the Praga equivalent suffered a lot of destruction during Nazi Germany's occupation of Warsaw and Poland. Only about 3000 tombs are said to remain more or less intact. Large parts of the former cemetery (it was finally closed in 1950) are little more than a field of rubble from broken headstones. Combinations with non-dark destinations: nothing in the immediate vicinity. See under Warsaw in general.